This is another in the guest posts I have received from various sources. Once again I am not endorsing Chartis, rather providing what I feel is a very good article on the safety of kids in sports. When you hear about concussions and head injuries in youth sports, football and hockey typically come to mind. Increasingly, coaches, parents and athletes all across the nation have grown increasingly attuned to the risks associated with these sports and the paramount need for safety protocols during both practices and games. When it comes to non-contact sports, however, the risks for concussions and other injuries are often overlooked. Activities such as cheerleading, gymnastics, swimming, volleyball, and skiing—to name a few—have considerable potential for serious head injuries. In fact, the sport of cheerleading, with its daring stunts and busy, year-round practice schedules, has become the leading cause of catastrophic injury in young female athletes, according to the 29th Annual Report from the National Center for Catastrophic Sports Injury Research at the University of North Carolina at Chapel Hill. While cheerleading and other non-contact sports may not require the same level of protective equipment as do football and hockey, it is essential that coaches, family members, and young athletes alike are able to recognize the signs and symptoms of concussions and possess the know-how to respond appropriately should such signs and symptoms occur. As the NFL and its former players do battle in the courts, the NFL is also battling to find out who was/is covering them from an insurance perspective. The answer is not so simple and really could be the tipping point in the sports concussion issue we are facing today. The simple reason is this, if insurance companies refuse to indemnify leagues, schools, clubs, etc. for whatever reason related to injury, then how will the get coverage? If they cannot get coverage then they cannot afford to provide the sport. The National Football League is seeking coverage from insurers that it says have refused to provide a defense as the league faces hundreds of concussion-related lawsuits from former players—but insurers are claiming they have no duty to indemnify or defend the NFL.The list of defendants in a civil case filed Aug. 15 by the NFL and NFL Properties in California Superior Court includes companies from insurance groups such as Chartis, Chubb, Fireman’s Fund, Travelers, Hartford, OneBeacon, Ace, Allstate, XL, Transatlantic, Crum & Forster and Alterra. Big name people. I was ready for a first-class PR presentation about how great youth football is and they don’t really need to change… and that is not what I found. Instead there was heartfelt sincerity by everyone in the room – almost all parents including Dad Goodell and Dad Hallenbeck of youth-sports-playing kids. And for almost two hours, we talked as just parents… Titles fall away when you share about your children and your fears & hopes for them. No one has a golden ticket to protect his/her child against a concussion. Despite his paycheck, Goodell cannot buy a better helmet for his child than I can. Despite his sports connections, Hallenbeck cannot protect his kids better than I can my own from a concussion. We are all vulnerable when it comes to our children and head injuries. Sadly with concussions, there is truly a level playing field – everyone’s children are potentially at risk on playing fields, playgrounds, gyms, backyards, pools and streets. There is no perfect sport to avoid injury, and there are even concussions in golf and crew (I know of these personally). And beyond sports, there are concussions in biking, running, horseplay, sledding, climbing trees, backyard fun, etc. We know that the answer is not found in bubble wrapping our kids. There is too much fun and excitement and yummy stuff to be found in the world and especially in sports, so off our children go to the playing fields, the basketball courts, and the baseball diamond. Over the past week The Sporting News has run a series about concussions; based on a survey of 125 former NFL players. 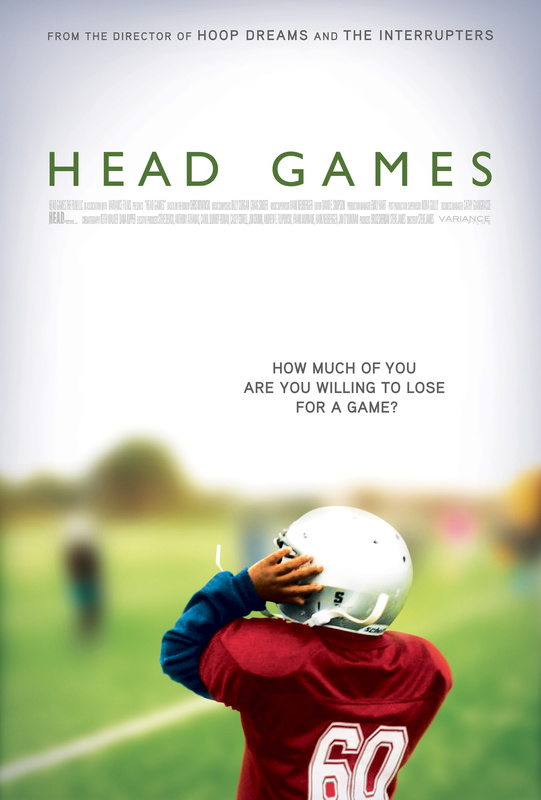 Granted the series was very informative, it again targets a sport that only shares responsibility in the concussion epidemic. Staying too focused on one sport will only delay or even overlook the other problems across an active life. I guess I have been on a kick lately to reinforce that the majority of all concussions do not come from organized sports. Rather, traumatic brain injury (minor or major) occurs most often in recreational activities: bike riding, horseplay, wheeled activities, pick-up sports, etc. The massive issue is not the concussion but the miss-identification and mismanagement of the concussion during sports. You can catch the trailer for this documentary HERE… Remember this is not a referendum on sports as a whole, rather it is a documentary exposing the risks. I would like to reaffirm that the injury of concussion is not the issue; the mismanagement of the brain injury is the problem. The handling of concussions in professional sports have been the easy target of people like me in the past. The hope was that with more stringent safeguards and protocols that this would not be an issue for much longer. The NFL has been an easy “whipping boy” because of its high visibility and constant coverage; now 2012 has its first head scratcher. Chris Rainey repeatedly shook his head in an effort to clear the cobwebs after getting KO’d by Indianapolis cornerback Jerraud Powers in the first quarter of the Steelers’ 26-24 preseason victory Sunday night. The rookie running back grudgingly relented to tests after being diagnosed with concussion symptoms by team medical personnel. After struggling to make it to the locker room, the fifth-round pick returned late in the second quarter. Last week the Federal Trade Commission came to a settlement with the company Brain-Pad Inc., to curtail and stop its misleading advertising about concussions. The details were not readily available but the fact that someone is taking notice makes me smile. As you may remember I have taken them and others to task about their claims; and have yet to get any formal or coherent response from any company after I ask real questions. In the category of must read, this piece on Grantland by Jane Leavy is one the mouth-breathing, booger-eating, Neanderthal types who thing science is ruining the game, should become acquainted with (if they can even read). Dr. McKee and people like me are not trying to take away the sports you love. In fact we are trying to save them, football included. “The coolest thing about Ann is she spends all day doing autopsies on NFL players and can’t wait for the weekend to put on her Packer sweatshirt and climb into bed with a big bag of popcorn and a beer,” says Gay Culverhouse, former president of the Tampa Bay Buccaneers, who now advocates on behalf of former players. “Well, I don’t usually do it in my bed,” McKee says. I have stated from day one, that simple awareness of what a concussion is and how it should be handled will help with the epidemic and looming issues in all sports. Football is the easy target but concussions come from all walks of life, mainly bike riding and wheeled activities like skateboarding. Awareness is spreading, and along with that there will be changes to the things we enjoy. They should not be taken away, but to prevent someone from doing that proactive steps must be taken. Across the board, only a few years after Coyne last played a down, attitudes toward concussions and how they pertain to the sport of football have changed, if not revolutionized. Where have I been, that is simple, football two-a-days began on the 8th and that took a majority of my time however there was more, A LOT MORE, going on behind the scenes. It seemed I was in a groove after last weekend but my world shook with some inconvenient timing and predicaments. Did you know all heat related deaths are preventable, 100% of them. Meaning every person that dies from heat illness could have been saved with some easy steps, Occam’s Razor is quite often applicable. The Korey Stringer Institute sole mission is to prevent sudden death in sports, especially as it relates to exertional heat stroke (the condition that took his life). Heat is part of the fall and sometimes spring sporting seasons, but you should also know that heat illness can fell any time, even in the indoors during the winter months (see wrestling). With that disclaimer out-of-the-way it is time to remind everyone to begin preparations for the upcoming season of sports. With a large portion of the nation dealing with sweltering heat these next few days (guess it was 108 in St. Louis yesterday) remember the possibility exists that our youth will be participating in these conditions. To prevent heat illness it begins with the individual preparing for the weather. Hydration, and not just 3 sodas the day before, we are talking nearly a gallon of water in a 24 hour period. The other very basic way to stem off heat illness is to simply not practice when the temps and humidity are absurd; if possible early morning or late evening times would be best if practice MUST go on that day. Every sport will be different in terms of a threshold for discontinuation of practice; soccer players are in shorts and loose-fitting tops, baseball/softball players have a dugout to rest in, where as football is all padded up with a helmet in tight uniforms. Naturally football would be of the greatest concern, and it is. The goal of a writer is to bring eyes to their information/opinion to draw eyes for advertisers who in turn pay for the publishing of the article – in a very cut and dry manner. With the troubles facing sports, particularly football, more and more articles have hit the interweb; often the most cited are those that trample on our beliefs of sport. While away on a family vacation I don’t get to the researching/data mining I usually do, inevitability there are events and happenings that occur that get push back in coverage. The nice thing is that the media and other sources are doing a wonderful job of highlighting the issues that come about. There are a few instances of concussion related news that I would like to now opine on. IF ANY PLAYER IS KNOCKED OUT FOR WHAT EVER REASON THEY SHOULD BE REMOVED FROM ACTIVITY, PERIOD. SCORE AND CIRCUMSTANCES SHOULD NOT HAVE A BEARING ON THIS DECISION. SAID PLAYER SHOULD NOT RETURN TO ACTIVITY UNTIL CLEARED BY A PHYSICIAN AFTER AT LEAST 24 HOURS. Steve Broglio, PhD is the lead author on a new research study that shows evidence of the cumulative effects of concussions. It may not be a “gross” outwardly as some are envisioning, rather the study does indicate that multiple traumas to the brain – be it subconcussive or concussive – will produce a decline in brain function. Broglio and his group looked at 162 “control” subjects and 62 subjects that had a history of concussion; as stated above the results were actually subtle in nature, none the less they were only noted in the group with previous head injury. Using balance and walking assessments along with brain electricity studies this research is the foundation for the “hit count” proposals. Is there a threshold for “aging” of the brain? It is number of exposures or the relative level of exposure that will be the catalyst? Concussion has been viewed historically as a transient injury with no evidence supporting the existence of persistent effects. However, our recent work demonstrates electroencephalographic and motor control changes in otherwise healthy individuals with a history of concussion. We therefore hypothesize that concussive and subconcussive head impacts set about a cascade of pathological events that accelerates declines in cognitive function typically associated with the aging process. I will be interested to see comments about this study, I have put in a request to talk to Broglio as well. Look out Iowa… I am headed to the Quad Cities area of Iowa to be a key-note speaker today at a seminar about concussions in adolescents (see high school aged). I would like to thank the hard-working Athletic Trainer Jason Viel of Pleasant Valley High School for setting up the program and thinking of me.